Preheat the oven to 400°. On a large rimmed baking sheet, set the squash cut side up and rub the flesh all over with the 1 tablespoon of olive oil. Sprinkle generously with salt and pepper and roast for about 1 hour, until the squash is easily pierced through with a knife. Let cool slightly. Reduce the oven temperature to 375°. Grease a 9-by-13-inch baking pan with olive oil. Using a fork, scrape the squash into the baking pan, arranging it in an even layer. In a medium bowl, mix the ricotta with the milk, basil, parsley, 1 teaspoon of salt and 1/2 teaspoon of pepper until combined. Spoon the ricotta over the squash, then the marinara. Sprinkle the sauce with the mozzarella and Parmigiano. Bake the lasagna in the oven for about 25 minutes, until the cheese is melted and bubbling. Let cool 5 to 10 minutes before serving. 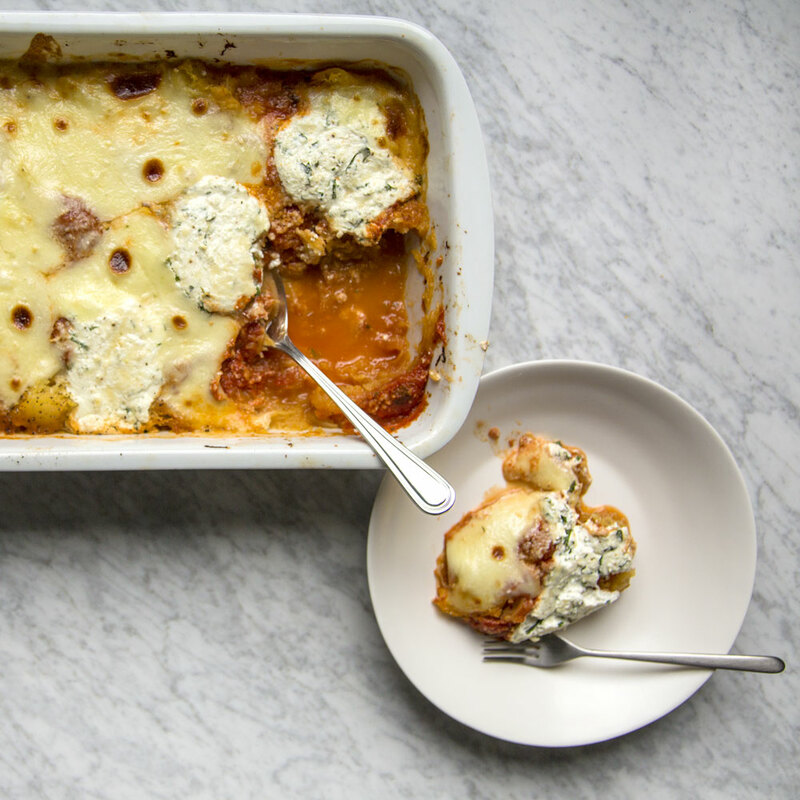 The assembled, unbaked lasagna can be refrigerated overnight. Bake according to recipe directions.